The Photoflex Softbox Speedring for Bowens/Impact Strobes is designed specifically for Bowens and Impact brand strobes and Photoflex brand soft boxes and octaboxes, though it will mount a variety of rod-based modifiers with 4-8 rods - experiment at your own risk. Speedrings are paired with rod-based softboxes, octaboxes, and other light modifiers to be mounted on the front of your flash/strobe to soften and shape the light to taste. To use, simply line the rods of your softbox (not included) to the pegs of the speedring like building a tent. Then, put the strobe and speedring together. These Photoflex brand speedrings are designed to mount onto Bowens and Impact brand strobes. 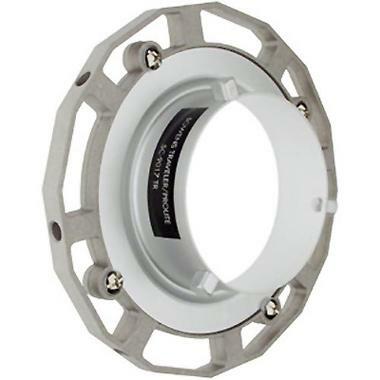 However, a variety of rod-based modifiers outside the Photoflex brand will connect to these speedrings. Experiment at your own risk.